Haul-Away Services: We are less costly per gallon. We eliminate hazardous waste hauling manifests and liability. Our process provides recycling opportunities (hauling away reclaimable process chemistries are costly!) Our technology and equipment provides the ability to treat immediately Vs storage tanks, leaky drums etc. 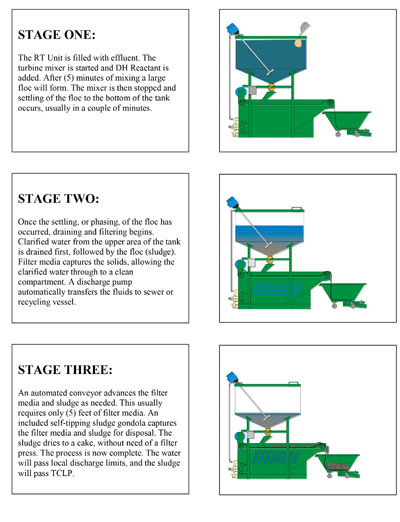 Ultra-filtration: Very slow process requires diligent back flushing and maintenance, no guarantee of meeting discharge limits to sewer (BOD and COD compliance is dubious), concentrated filtrate is typically 10% of volume. Will not remove dissolved heavy metals. Costs of $500.00 per drum for haul-away and hazardous waste manifests are not eliminated. Evaporation: This is a slow process and does not embrace recycling possibilities. Will likely violate clean air emission regulations. Hazardous sludge manifest and expensive haul-away. Clean out of equipment is tedious and requires handling of hazardous waste. Energy costs are VERY HIGH. As you investigate us further, you will become acquainted with the wide variety of aqueous streams we treat. We believe ours is the strongest equipment and process guarantee in the environmental industry. We have designed and installed over (350) systems in the past (14) years. Many systems have been repeat sales to clients with multiple locations. Our highly experienced staff and our network of Stocking Distributors who cover the U.S., Canada and a growing number of other countries – are ready to work with you. We encourage you to contact us for an on-site assessment of your needs.